The Ecseri Flea Market is a complete delight for flea market lovers. It is quite a fun experience to explore the dirt cheap flea markets and in a way are representation of the lively local side of a city. Ecseri Flea Market is easily the second best flea market in Budapest and is located at the outskirts. The locals have found their way through the best of items here and end up grabbing the best of items by visiting early in the morning. Tourists however love the whole feel of the place as it makes them connect a little more to Budapest and feel a little more locat. That too, at very reasonable rates! On weekends, the market gets very crowded. Hence, early morning hours are recommended. How popular is Ecseri Piac Mercado? People normally club together Celeritas Shooting Club and Buda Caves while planning their visit to Ecseri Piac Mercado. People also prefer to start their day with Ecseri Piac Mercado. The best and biggest flea market in Budapest. Best to visit on Saturdays morning. Wide choice of paintings and antiquities. Very interesting to visit, but be very cautious when buying. This fantastic flea market on the outskirts of the city is a great place to find a bargain. It is possible to pick up a variety of different treasures from here, although you may have to search through stalls full of things that you consider to be trash in order to find them. Even if you are not planning on buying anything, it is still possible to wander for hours amid the stalls, dreaming about the past owners of all of this bric-a-brac. 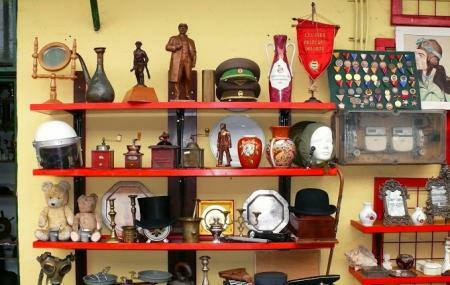 Stalls sell everything from retro clothing, through to memorabilia from the Communist era. Haggling is recommended, although you should expect to pay a bit more if you are not a local. A dedicated, covered flea market situated at the outer neighborhoods of Pest. Best to visit on Saturdays. Prices may seem outrageous at times, but some are negotiable. Worth a visit if you are a fan of the antique or vintage hunting game. I'm very into history, but any memorabilia from the communism/fascist era is either fake or very expensive. Go earlier and on the weekdays for full experience, I went on Saturday mid day and many stalls were empty. About half were open. Other than that a very good flea market, worth a bus ride!